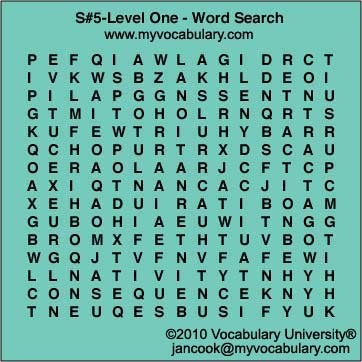 The OBJECTIVE of this ROOT WORD SEARCH is to reinforce vocabulary word mastery from vocabulary word puzzles and Latin roots. You may make a copy of this Word Search page and answers by clicking on "Get a Print out." The root word vocabulary list comes from the Latin roots NAT = be born; TRACT = pull, draw; and SEQU-SECU = follow. Words can go horizontally, vertically, diagonally, forward or backward. 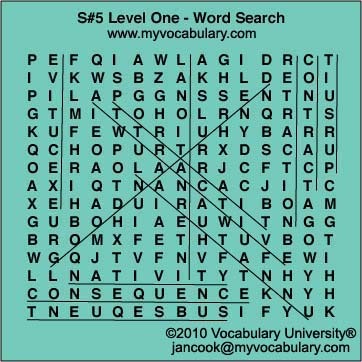 In addition to this Root Word Search activity for Root Word #5 Beginner, www.myvocabulary.com also offers a free Interactive Puzzle, Definition Match, Fill-in-the-Blanks, Synonym & Antonym, True & False, Reading Passage and Crossword activity. You have permission to make a printable copy for more vocabulary study at home or in classes.